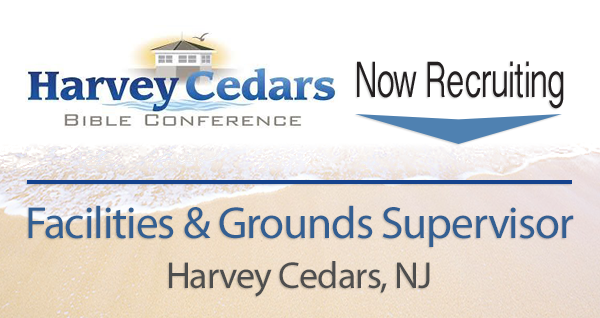 Harvey Cedars Bible Conference (HCBC) is a Christian Conference and Retreat Center nestled between beautiful Barnegat Bay and the Atlantic Ocean at the Jersey Shore. HCBC operates year-round to provide affordable Christian conferences, retreats, and family vacations. Whether it’s a mid-week board meeting or a weekend event, they offer a wide range of accommodations and meeting spaces to suit groups from 25 to 400. For generations, the body of Christ has enjoyed gathering and growing here. Young people are especially drawn to our shore location and facilities. Each year approximately 2,000 college students and 3,000 high school students come to the Conference to learn more about God’s Word and the person of Christ. 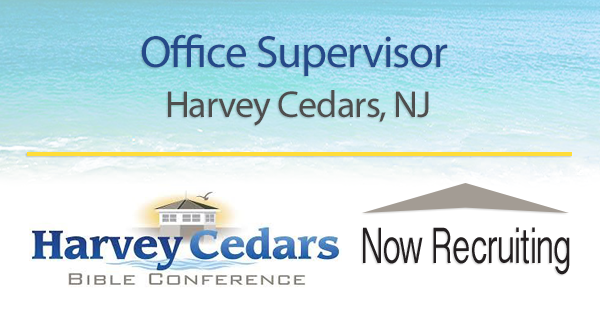 The purpose of the position is to advance the Mission of Harvey Cedars Bible Conference through the supervision of the office and improvement of hospitality to our guests. Establishes a system for reservations and regularly reviews same in order to maximize efficiency and improve service to the guests. Communicates reservation information on a timely basis to the Food Service Supervisor and the Housekeeping Coordinator. Works with the Operations Director in organizing weekend retreats; especially regarding guest needs and special request. Develop tools and systems to better receive our guests, provide them with a better stay, and see them off well. Create and administer the At-A-Glance, making sure that each activity/event is happening, staffed and on time. Make sure guests are comfortable in their meeting spaces. Work alongside our retreat coordinator and reservations. Second in line for phone inquiries behind retreat coordinator. Second in line for tape chart responsibility. Responsible for yearly retreat calendar in Outlook. Retrieve guest info/needs one month in advance of retreat. Responsible for petty cash and deposits for group payments. Oversee vending receipts and change machines. Assist with staff hiring when needed. Oversees the office staff regarding receptionist policies and etiquette. Schedules office personnel working hours, and assigns them their duties. Assess and benchmark office procedures and takes steps to make improvements. Performs annual reviews of office personnel (under their supervision). Prepares deposits, accounts receivable and accounts payable. ones to the Executive Director. Prepares payroll; tallies timesheets, collects pertinent information from employees. High-level of effective interpersonal communication skills, both written and verbal plus, organization and presentation skills. Strong desire to be a part of an organization with an entrepreneurial spirit and a fast paced, result-oriented culture. High school diploma or GED; Two-year Technical school in an accounting; or equivalent combination of education and experience. 5 to 10 years’ experience in office environment. Must at least 1 to 5 years of supervision experience. Must be able to work well and effectively with the public. Must be proficient in Microsoft Office & Outlook. Complete support of and willing adherence to Harvey Cedars Bible Conference’s mission, vision and core values. Applicant must hold these standards as his/her own. Purpose of Position: To advance the Mission of Harvey Cedars Bible Conference through the maintenance of all facilities, keeping of the grounds, and ongoing safety and security inspections. Oversee and with a hands-on approach, participate in the maintenance of all conference facilities, including preventative maintenance. Coordinate the work of licensed contractors in the performance of maintenance. Responsible for keeping the landscape of the grounds maintained. Responsible for all seasonal grounds maintenance work such as: plowing, shoveling, salting, etc. Perform periodic safety inspections of the facilities with the operations manager and bring issues up to standards. Investigate reported unsafe conditions, accidents and near accidents. Responsible for various inspection certifications required for facilities & grounds. Responsible for making sure that the grounds & facilities are safe for all personnel, contractors, vendors, and the public. Develop and submit a monthly report highlighting successes and concerns in regards to facilities maintenance, landscape/grounds, and safety and security. Work well alongside other departments that need assistance. Approves appropriate check requisitions for payment for their department. Perform miscellaneous other duties at the specific requests of the Operations Director and Executive Director. Develop a volunteer program for facilities maintenance, landscape/grounds, and Safety & Security. High school diploma or GED; Two-year Technical school in a trade. 5 to 10 years’ experience in a learned trade. Some knowledge of Microsoft Office & Outlook preferred. Some knowledge of building, frame, electric, plumbing, HVAC, painting, preferred. Enhancing outdoor living through design & craftsmanship with integrity. Stump’s Quality Decks and Porches is a deck contractor that specializes in building long-lasting decks and porches in Lancaster, Lebanon, Berks, and Chester counties. We design and install decks made from pressure treated wood, vinyl/composite, and exotic hardwoods, as well as gazebos, pergolas, sunrooms, and screened-in porches. Purpose of Position: The Lead Sales Representative is responsible for establishing and maintaining profitable relationships with customers. The Lead Sales Representative has primary responsibility for ensuring that the products meet the customer’s needs. Responsible for handling all unique job requests with customer’s. Responsible for establishing and maintaining profitable relationships with customers within a 1 hour and 20-minute radius from Company location for customer projects. Responsible for maintaining customer relationships throughout the whole project which includes start of project to end of project. Required to attend all company meetings & occasionally assisting in emergency jobs or other labor tasks. Responsible for requesting customers to participate in the customer rating on-line system. Responsible for notifying the right people at Stump’s to handle any concerns, or problems with the products that you are made aware of by the customer. You are the customer’s first contact. Maintaining up-to-date knowledge of industry trends in order to serve as an informational resource to management and customers during off season. Assisting in Marketing with Website/Brochure redesign every other year. Responsible for posting new photos to website, Houzz and other social networks. During off season, required to attend and work at least two (2) home shows per year. Responsible for all follow-up with customers on any issues. Google docs for all customer proposals, price work-ups, current changes during project. Participating in company sales and marketing meetings at the corporate office. plus organization and presentation skills. Excellent communication skills, both verbal and written, a positive attitude is important. Ability to learn quickly in a fast paced environment. High school diploma, or GED. A minimum of 3 – 5 years of construction sales experience, or related field. Sales experience with an emphasis in decks & porches a plus. Knowledge of deck building preferred. Microsoft Office – Word, Excel, Google E-mail, Google doc., Google Calendar. 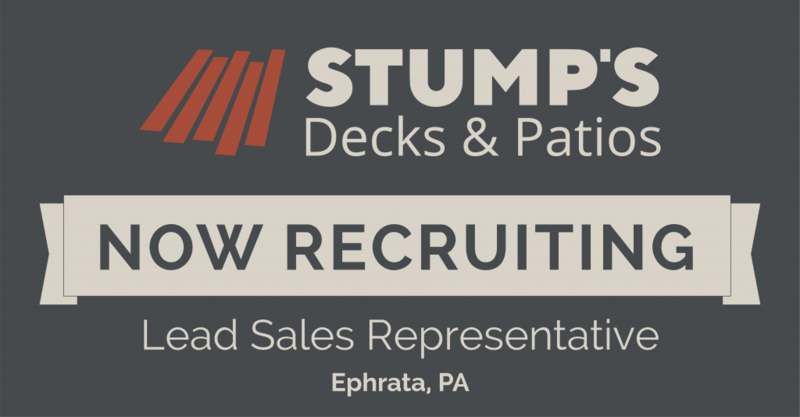 Complete support of and willing adherence to Stump’s Quality Decks & Porches’ mission, vision and core values.Applicant must hold these standards as his/her own. The economy has been changing rapidly over the past several months. Now more than ever employees are starting to look at their career options. Turnover issues transcend all profit and non profit organizations. When employees sense no potential for career progress, or leaders are unaware that advancement is important, they look for better options. When employees receive little or no gratitude for their contributions, it’s demoralizing — they seek more rewarding work elsewhere. The biggest surprise? Many times, during exit interviews, departing employees disclose that a simple, verbal “thank you” would have made them feel sufficiently appreciated. Without savvy leaders or a solid idea of the big picture (Vision), employees don’t see concrete, interesting ways to contribute outside of the ordinary scope of their jobs. Things grow tedious and employees hunt for new challenges to make work feel more meaningful. So, while you might think your employees desire high pay, a corner office, or a cushy benefits package, the truth is that the best employees are satisfied with simpler, more personal benefits. Be thoughtful — find out what motivates your employees! This simple investment will ensure improved worker retention, enhanced overall morale, and increased organizational loyalty. And isn’t that what you really want? What can you do as an employer right now to keep your best employees? This article provides some great ideas. One more thing…what’s the Surprising New Reason People Quit? Not long ago this reason primarily concerned mothers, but now both men and women will leave pay increases and promotions behind to have a manageable work schedule that doesn’t crowd out the rest of life. Keep in mind that, as a new generation of workers comes of age and/or starts having children, many will value fulfilling connections with family and friends above a full workload. Climbing the workplace ladder is simply not as important to young workers today as in prior generations. Many are talented and capable, but will choose a desirable work-life balance over monetary or organizational rewards. 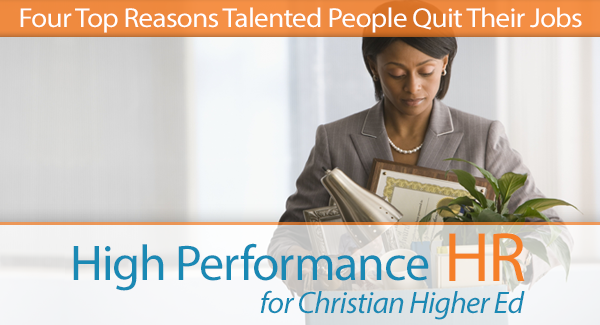 So, if you are concerned with retaining talented employees while also saving time and money in hiring and training costs, remember these Top 4 Reasons and the new trend that makes talented people quit. It could make keeping great people you need much easier. In May 2012 How to Build “Kingdom-Minded” Organizations by Mark A. Griffin was published, and its success was significant that organizations across the US and UK now use it as a guide not just within leadership teams but also boards of directors. Six years after its first publication, in response to popular demand, How to Build “Kingdom-Minded” Organizations has now been translated into Spanish. Since the 2008 global financial crisis, the world has endured some of the toughest economic times since the Great Depression, with business leaders and employees alike enduring increasing pressure simply to survive. Too often, the workplace has become devoid of hope and genuine purpose, despite it being where many of us spend the majority of our time. In that time, author Mark A. Griffin, an HR consultant and career coach, has traveled the world researching, partnering and exploring how poverty can be alleviated by job growth within suffering countries like the Ukraine, India, Honduras, Nicaragua, Haiti and the Dominican Republic, in contrast to the charity model that more often fails. That has created increased demand for the book’s release in other languages. After more than 25 years in a corporate world where pursuit of profit has become paramount, Mark Griffin is adamant there is a better way to do business. In How to Build “Kingdom-Minded” Organizations, Mark inspires Christian business leaders who want to create a values-led organization to bring Christ into the workplace. With more than two dozen years as an HR executive in companies ranging from small to high-profile Fortune 500, Mark Griffin has emerged as the leading thought expert in human resources from a Christian perspective and speaks at conferences nationwide. Mark also inspires thousands of listeners through a network of Christian radio stations and a 12-part podcast series based on his book. Mark’s remarkable book continues to empower business leaders to be bold about bringing their faith into their workplace. Aware that it takes great courage to step away from the business practices that dominate America’s corporate world, his book provides simple and effective tools designed to constructively integrate the teachings of Christ into any organization. It provides the starting point for those who want to create, build and develop their own profitable values-led business as a stable, positive environment in which employee wellbeing is enhanced, improving quality and productivity. Through his organization, In HIS Name HR LLC, Mark is on a mission to provide world-class business consulting that allows clients to be prosperous while still “Kingdom-minded,” by instilling a Christian ethos and establishing goals that reflect that ethos. Radical, inspirational and affirmative, Mark Griffin’s template for Kingdom-minded businesses is an idea whose time has come. 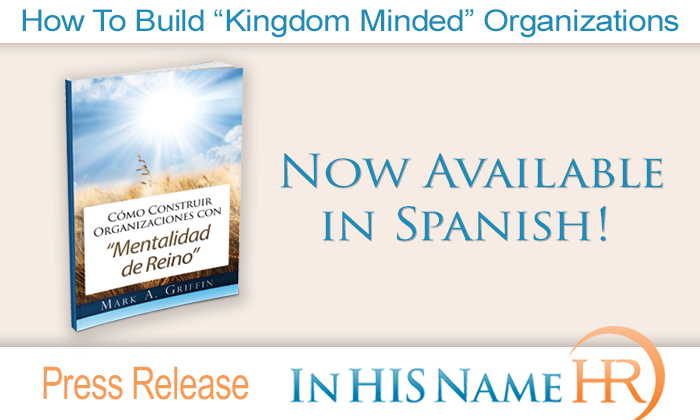 How to Build “Kingdom-Minded” Organizations is available in both English and now Spanish at Amazon.com. To learn more about the Spanish edition please visit: www.organizacionesorientadasalreino.com. Learn more about Mark A. Griffin and his quest to help the Christian-owned company live their faith by visiting him at www.InHISNameHR.com, or connect with him on www.Twitter.com/InHISNameHR. 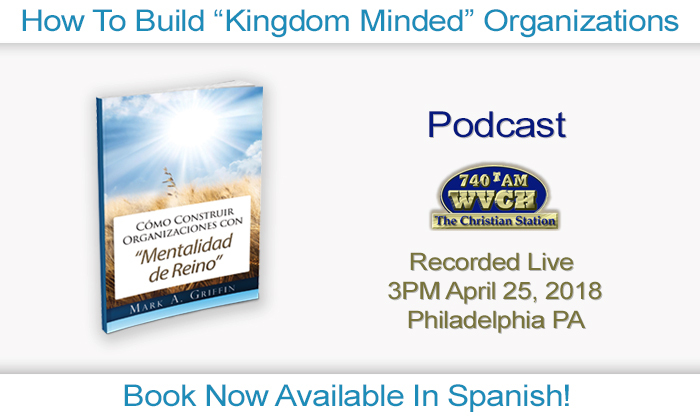 Enjoy listening to Guest Mark A. Griffin discuss the rerelease of his book, How to Build “Kingdom-Minded” Organizations in Spanish with host Charlotte Cosden live at studio headquarters. Have iTunes? Podcast is available through iTunes. WVCH is a Blessing – Serving Greater Philadelphia and The Delaware Valley Christian Listeners for over 50 years! Tune in and listen to WVCH’s weekly radio show “Be The Guest,” hosted by Charlotte Cosden. In May 2012 How to Build “Kingdom-Minded” Organizations by Mark A. Griffin was published, and its success was significant that organizations across the US and UK now use it as a guide not just within leadership teams but also boards of directors. Six years after its first publication, in response to popular demand, How to Build “Kingdom-Minded” Organizations has now been translated into Spanish. Guest Mark A. Griffin, Chief Consultant at In HIS Name HR shared his experiences in helping shape organizations to be Christ centered and profitable. With over 20 years of Human Resources experience at both fortune (Kodak, Quaker Oats, and Merck) as well as small and mid-sized companies, Mark has seen it all. Huge changes in the labor force draw near. Here’s how to get prepared! Baby Boomers are a very influential demographic of people born after World War II, in the years 1946‒1964, and will soon represent a whopping 40 percent of the workforce. In 1950, only one in six workers were over the age of 55. In less than two decades, one of every four workers will be over age 55. Multigenerational organizations are now the norm, with many organizations employing people who are in their sixth or seventh decade of life. The impact is enormous. It will continue to affect the workplace everywhere in the U.S. Some Boomers plan to retire, leaving giant gaps and a vortex-style “brain drain” across most industries. Others will stay working or shift to part-time employment, creating new challenges most organizations are unaware of or unequipped to handle. Either way, the costs could be devastating, so preparing now is crucial. Economic woes have resulted in most Boomers not being ready for retirement at the normal age range of 62 to 70. The AARP reports that a full 25 percent of Boomers have no savings on which to retire whatsoever, and a mere 14 percent plan to retire when the time comes. Nevertheless, only 52 percent of organizations have policies to rehire retired workers. Ensure that your organization is ready for this inevitability. Many Boomers have vast working experience, crucial expertise, and command top pay. Too few organizations are utilizing Boomers to train younger workers while they are still around. Job mentoring, job shadowing, and job sharing with younger workers are three important options to make the transition less painful. Move quickly to create programs to train younger workers alongside Boomers before it’s too late. Additionally, more sophisticated recruitment and hiring programs are needed to find qualified and competent talent in a shrinking pool with a wider age spectrum. Most organizations are not prepared to accommodate aging workers; so work-related disability claims are expected to rise sharply. That’s expensive! Take steps now to create a safe and accommodating work environment to avoid injuries and to make working less stressful for an older workforce. A Human Resources consultant can assess what changes are necessary to avoid workplace injuries and boost morale. Those Boomers who want to continue working often face discrimination and prejudice. In truth, this population typically comprises excellent workers who are far more flexible, able to learn, and more technologically savvy than the persisting stereotype would have us believe. Plus, employment laws protect them against unfair hiring practices. Avoid lawsuits and potential problems by knowing the law and complying with it. 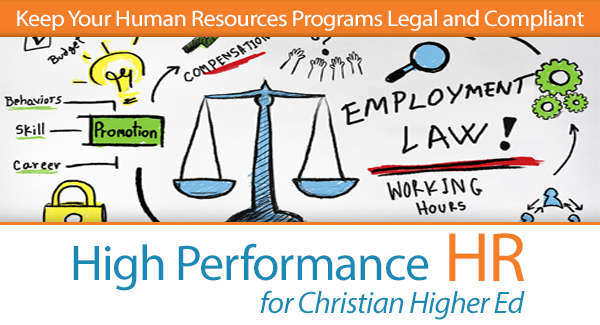 If you have not read this article regarding HR legal compliance, please do so. According to the Sloan Center on Aging and Work, organizations can do a lot to ensure that Boomers work to an older age and do well on the job. Flexible work options, participation in decisions, chances to develop new skills and competencies, and regular engagement will help Boomers succeed in your organization for years to come. By valuing them properly, you will mutually reap the rewards. As the demographic shifts, many organizations will experience disruption or harm—but it doesn’t have to be your organization! Right now is the time to make sure that you are prepared for the biggest demographic shift in the history of American labor. Find the right person for the right job! It sounds simple, but it won’t come easily without planning and a process. Getting the wrong people not only kills performance but can also damage your reputation. And, of course, you don’t have the money to do it wrong. Training misfit or unqualified new employees always costs more in the long run than hiring the right person in the first place. Additionally, turnover is higher if employees haven’t been recruited properly. Employees grow disappointed when their position is out of their depth or the job isn’t what they thought it would be. They leave as soon as they find a better fit. How do you hire people the right way? How do you find talent well suited for your organization and its open job position? (1) Develop and Finalize a Thorough Job Description. Train employees to create their own descriptions, because they know their job better than anyone. Without a clear job description, when employees discover that a lot more is expected of them, frustration and stress result. Draft a description that is not too generalized—vagaries only hurt your organization and catch new hires off guard. At high-performance organizations, employees know why they are there and what their specific job duties are. The description should note expectations of the job, skills or education needed, and duties and related responsibilities; plus, who they report to, and when. Include how they will be evaluated, and who will train them or be available to consult if they run into trouble. A filter is created from the core requirements of the job description. It gives the resume screener a baseline to efficiently weed out resumes and applications that don’t meet the minimum qualifications of the descriptions. Consider outsourcing the screening process to a professional firm that will funnel the best prospects to you, or enlist someone to handle the slush pile of applications, and then feed you the cream of the crop. Filtering the process is important. It pays to spend the time and money up front to ensure a well-tuned process. An outside Human Resources firm can set up all the details involved in your recruitment and hiring process to streamline and maximize the procedure. The result will be a clear and useful tool to boost organizational performance and save costs. Are you complying with all the proper state and federal labor laws? If not, it could cost you everything. Christian Higher Education is not immune from compliance. And compliance is very important. In our opinion Christian Higher Education may even be more susceptible to investigation then other organizations. In large organizations, an entire human resources (HR) department navigates the complex minefield of federal and state labor laws. Some small organizations (under 100 employees) think of HR as an afterthought, or HR responsibilities like hiring, benefits, compliance, and payroll falls to a few people who aren’t properly trained. This can be a pricey mistake. Laws concerning overtime, unlawful termination, and equal rights are just a few areas that trip up organizations, big and small, all the time. Labor laws fill volumes and are quite complex. Plus, labor laws vary from state to state! Even Walmart ran into trouble recently and incurred $4.83 million dollars in back wages, penalties, and fines for violating The Fair Labor Standards Act. The mistake? Managers were misclassified and not appropriately compensated for overtime work. Unlawful termination is another problem that has cost organizations like UPS, Carmike Cinemas, and Dial Corporation dearly. Yes, it’s tricky. Do you know the laws? It gets worse—the government is ramping up efforts to check up on organizations and crack down. The Obama administration in 2017 allotted $25 million for the sole purpose of investigating those misclassified as “independent contractors,” hoping to reclaim alleged lost tax revenue and increase the IRS’s revenue. Be smart. Remember that stiff penalties and lawyer fees can decimate your organization. Are your workers properly classified? Child labor, non-resident labor, and equal rights legislation are the three areas where many organizations most often fail to comply. Both state and federal labor information is free and available online. 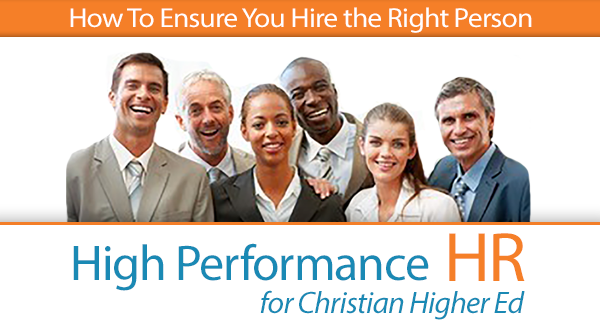 Outsourcing with an HR professional firm can save your organization a lot of time and money. Most organizations with fewer than 100 people benefit from outsourcing labor law compliance and other human resource tasks to HR professionals. The alternative is risky: employees are often uninformed about and under-trained in labor law compliance. Look out! Federal fines could be in store for you. In addition, HR often falls outside an employee’s main job focus, so getting it wrong or spending valuable time away from primary tasks can cripple productivity in a small organization. Get the right person trained or on your team to comply with labor laws. Regrettably, staying legal has never been more difficult or important. Make 2018 your organization’s best year ever. Make sure to get the Human Resources help you need right away. Today, we build on the two previous posts, on creating Mission and Vision Statements by discussing Core Values and creating your organization’s Value Statement, which completes the triad. When organizations desire to perform at the highest level, they leverage three (3) commitments—three commitments that set the stage for overall efficiency, growth, and prosperity. 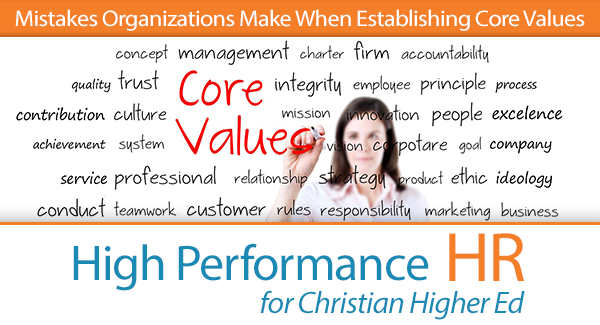 Core Values focus on how you run your organization and interact with customers and suppliers. Not everyone possesses the same core values, so it’s important for an organization to stress what theirs are to employees, vendors, and customers at the onset of hiring, doing business, or providing a service. With its expressed Value of caring, Facebook is guided toward their vision and mission of accomplishing bigger and more important goals. It is yet to be seen whether Facebook will be foiled by one of the 5 very common mistakes we are about to explore here. Your Core Values must be built into your performance management process or the oversight to ensure success will be sorely absent. By limiting this list to reflect only your highest priorities, your core Values will be focused and accountability will increase. It’s tempting to make a long list of Values that you think are important; however, when you keep the number to about three or four key items, you make enacting them easier and more likely. Potential employees should know how things work and what it’s like at your organization from the start. When someone does not subscribe to your Values, don’t hire them. Some core Values can end up seeming disingenuous or hypocritical once mistakes are made. The best way to inoculate your organization from this is to disclose that possibility up front. Your students, instructors, vendors, customers, and employees will appreciate your honesty and be more likely to give you the benefit of the doubt, should problems arise. Core Value Statements are crucial to the culture of your organization and shouldn’t be taken lightly. The best way to ensure that your trio of Mission, Vision, and Value Statements will succeed is to ensure they are integrated into all you do from an HR perspective. By avoiding the common mistakes and using top-notch methods, you’ll ensure that employees can achieve your Mission and Vision by adhering to the core Values most important to your organization. 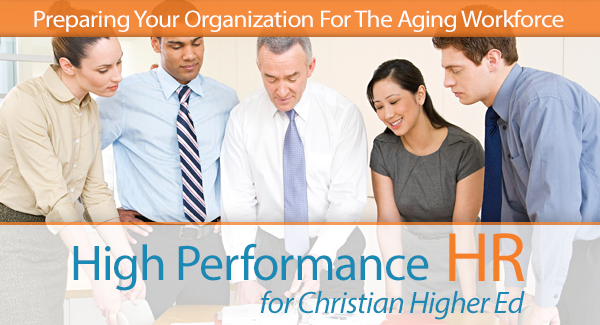 A high-performing organization is one that can last and even thrive in tough economic times. It must by guided carefully using processes that ensure consistency and stability through the Values you hold most dear.